Illuminated with a tin-can candle. Photo: Paul Kirtley. 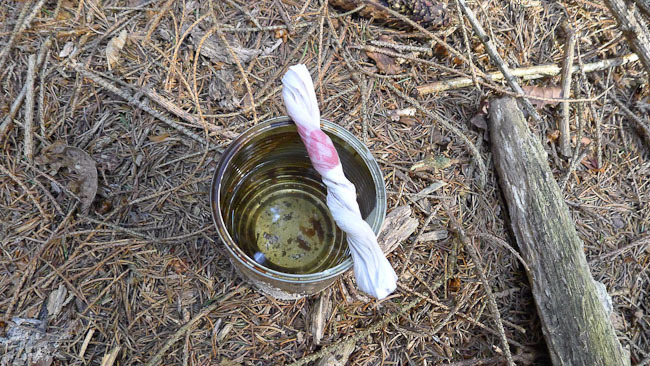 If you use any sort of candle holder in camp then you will end up with stubs of candles left over. Rather than wasting this wax, you can make a really good improvised candle from these remnants. The only things you will need in addition to the stubs of candles are a small tin can and some paper towel. Both of these are usually readily available in a base camp. Small tins of fruit or sweetcorn are of a particularly useful size for this project. First give the can a quick rinse out with water so there are no foodstuffs left inside. Collect the candle stubs and when you have enough pop them into the tin can filling at least a half of the tin. Don’t worry about trying to remove the wicks of the original candles. It doesn’t matter. Keep and collect stubs of candles like this. Photo: Paul Kirtley. You’ll need to have an established campfire to melt the wax of the candle stubs. 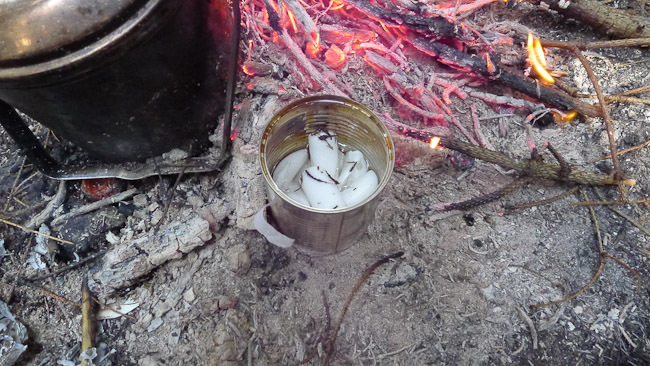 Place the tin can next to a campfire and allow the radiant heat of the fire to melt the wax of the candle stubs in the tin. Beware! The tin can will also be hot. Place the can next to the fire. Photo: Paul Kirtley. When the wax has melted completely, it will form a clear liquid. The wax is now ready to introduce an improvised wick. Take the tin away from the fire. Use some heat-retardant gloves or tongs to move the tin. Let the wax melt completely. Photo: Paul Kirtley. 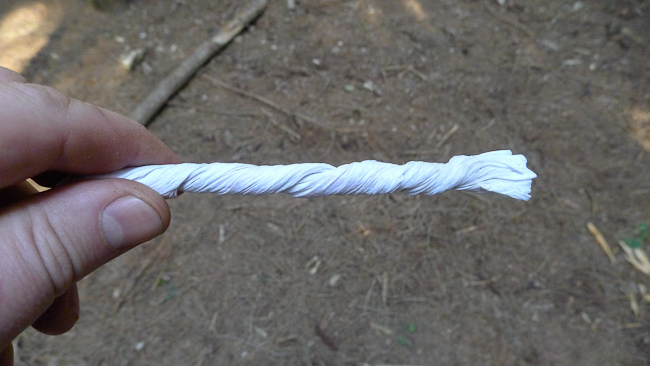 Take a piece of paper towel and twist it up into something around the thickness of a pencil. 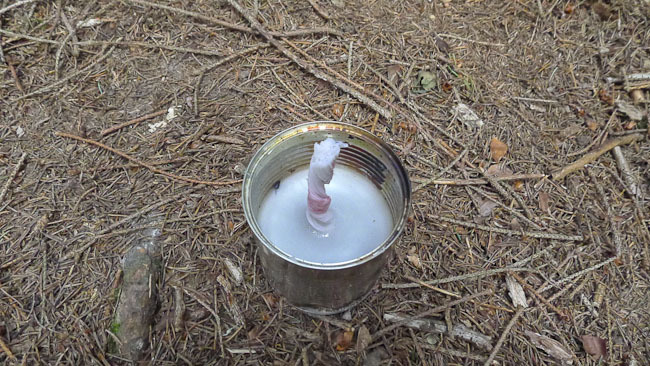 Twist up an improvised wick. Photo: Paul Kirtley. Dip one end of the wick in the wax so that it is coated and allow this to dry off a bit. Dip the wick in the molten wax. Photo: Paul Kirtley. One end of the wick already soaked in wax. Photo: Paul Kirtley. Then invert the wick and place it into the wax, so that the entire length of the wick has been soaked in wax. 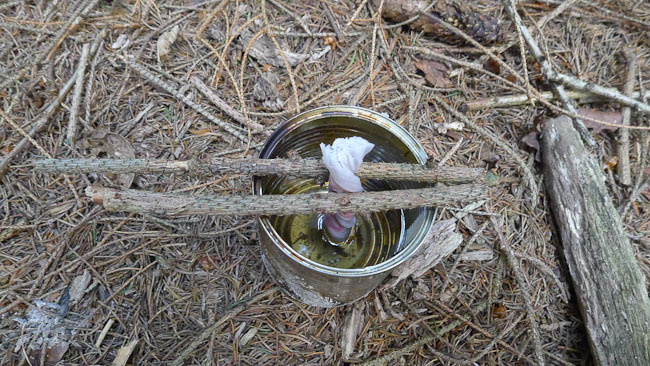 The wick should be positioned in the centre of the tin but will not stand up unsupported. So you must hold the wick in place until the wax sets. The easiest way to do this is take a couple of sticks and placed them across the top of the tin either side of the wick, holding it centrally in the molten wax. Invert the wick, so the soaked-end is upward and place it into the wax. Then support with a couple of small sticks. Photo: Paul Kirtley. As the wax sets, it becomes opaque again. Photo: Paul Kirtley. Once the wax has set, you can remove the sticks and you will be in possession of a fine improvised candle. Please note that this candle will burn much more strongly and brighter than a normal household candle. This is ideal when you want more illumination in camp than a single candle will provide. 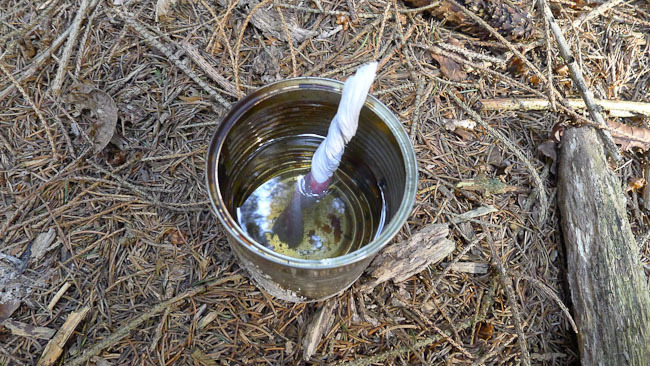 Once the wax has re-set, you have your tin-can candle. Photo: Paul Kirtley. You should also note that it is quite difficult to put out and the tin becomes hot. 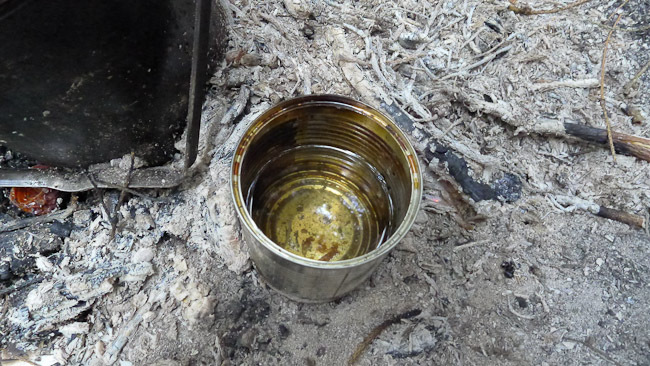 Therefore you must be careful about the surface on which you place the improvised candle and you must also take care not to pick up the tin while it is hot, even after the candle has burnt out. 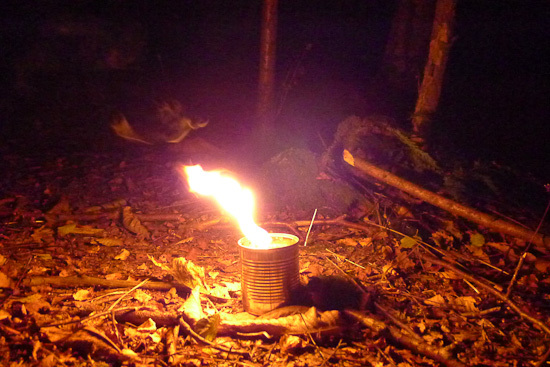 These candles provide a great source of illumination even on the darkest nights in camp. They are also really quite wind resistant, partly because of the size of the wick and flame as well as the natural wind protection provided by the sides of the tin. Tin-can candles provide good illumination. Photo: Paul Kirtley. 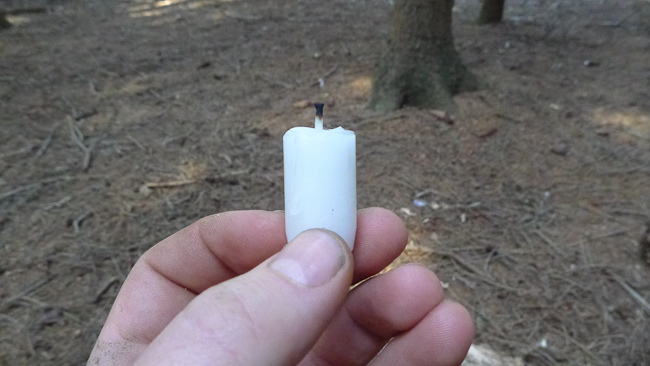 So, next time you’re using candles either in a candle lantern or candleholder around camp, why not save the candle stubs and make one of these great improvised candles? Thanks for the article Paul, great little candle i will certainly be making them from now on great idea and no waste. I usually have stubs left over as i take some strong clear plastic bags with me for base camp and fill the bottom with sand or dirt and place the candle in the center they give off a good light and are also wind proof and if done properly safe. When striking camp i empty the bags and put them by. I take the stubs home, now i can make tin candles with the left over stub. i will also be giving your candle holder a bash that’s another neat little trick cheers Paul.. Thanks for your comment. Interesting to read your plastic bag/sand method. I’ve not tried it but I get the idea – another option to add to my armoury so thanks for that. I’m glad you liked both the tin-can candle and candle-holder. I hope they work well for you. Let me know how you get on with them. Glad to see the stubs of the candles used up! That is one big flame! I bet you can’t touch that can for awhile. Have you ever had wax leak out the seam? Thats cool Paul, i will have to give that a go. Ive never done one like that. Hi Dave, glad you like the idea. Let us know how you get on with it. Good light from them and I’d suggest that they are a lot less noxious than those compressed wax/ wood chip blocks that you can buy and definitely cheaper! Another good one, I had not thought of this and I am quite impressed by it. We have in the past made similar lights from small tobacco tins using 2 or 3 night light wicks and the wax from them melted into the tin for the candle. But this does not use up the candle stubs we have laying about. Thanks Bill, glad you like it. I certainly won’t be throwing away any more old candle stubs! Too bad I didn’t know this a few months ago when I tossed out quite a few I’d accumulated over the years. Yes it’s a simple tip but one that we’ve found useful in camp. It saves a lot of waste. 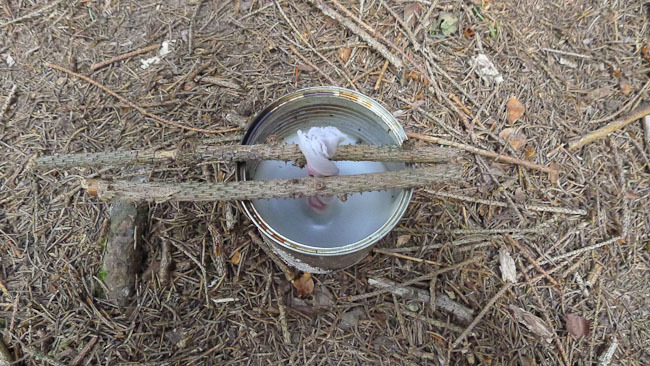 You’ve missed an excellent opportunity for an obvious bushcraft pun there; Tin Can-dles. Another neat idea Paul. Like it! I do something similar with old candles, some ‘unused’ paper ketchup holders (from a well-known fast food outlet) and some old fashioned white string. 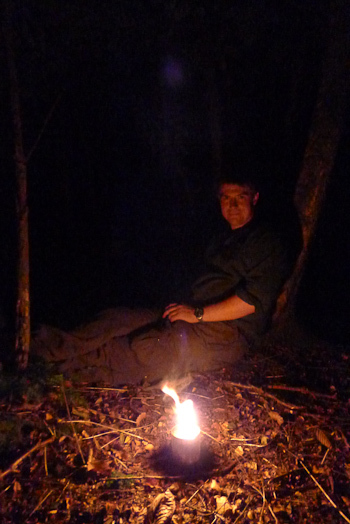 They make great little fire-lighting “assistants” when the conditions are testing! The best source for getting candle stubs are CHURCHES ! You normally just have to ask the priest or reverend after the service. So to visit the service in a church from time to time can be very enlighting! I do not recommend to stick candles in sand. Hot sand on a candle is as bad for the candle than cold wax in the sand is bad for the nature. You should use a wooden candle stick, that you can burn after using. Especially if you use the candle while you are cooking on a fire you will get hot sand on your candle, that will melt it. You should try to hold your candle clean! Not so shock proof, but not becoming so hot would be an old ceramic cup or bowl. Cotton doesnt break as fast as paper. You also can buy thick wicks in shops, may be the best option. Yes, that’s a good alternative. And agreed – they don’t half kick out a good amount of heat.